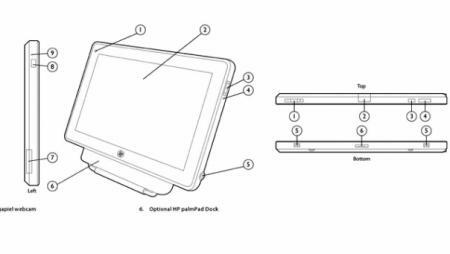 FoxNews has uncovered the above sketch detailing the upcoming palmPad, which they say will debut at CES in January. They say there will be four models of the palmPad, all running webOS 2.5.1. They claim that all four will be "a spin-off of the never-released HP Slate." That latter claim is incorrect, of course, as the Slate was released, albeit in limited form. One version, for consumers, will run on Sprint's WiMAX 4G network with specs "nearly identical" to the iPad, but adding HDMI-out, front and rear-facing cameras (1.3mp and 3mp). The palmPad is apparently slightly thinner than the iPad, with a 9.7" inch screen, weighing 1.25 pounds, has a USB 3.0 port, and what they are calling a "multi-switch" that presumably is designed as a silent switch. The image above provides further details - including an optional dock. Up top we see what appears to be power, volume, and that "multi-switch" switch. On bottom we see a dock connector and two audio ports, presumably one is a speaker and the other is a microphone. On the right we see a headphone jack and the aforementioned USB 3.0 port. The lefthand side is more curious, there is a section that looks like it could be a SD card slot and what looks to be a Mini-HDMI port for video-out. Another version will have an 8.9" screen and be targeted towards education. That will be debuted later in the year. Clayton Morris suggests that the palmPad (note the lowercase p in Palm) will be announced at CES in January and released in March. Update: Not to toss too much cold water on these rumors, but a couple things to note. 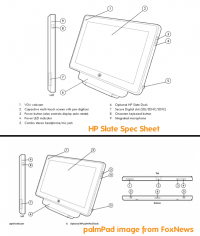 A closer look at the supposed palmPad sketches next to the Windows 7 HP Slate seem to strongly indicate that what we are looking at is simply sketches of the Slate with the palmPad name attached to them. The Press Shots from this Engadget Gallery show that all of the ports line up exactly with the sketches above, including the supposed 'palmPad dock' above. Whether this means that the rumor is false or the result of a mashed-up leaked document that happened to include the Slate's photos pasted with the PalmPad's specs or... something, we don't know. In any case, consider this one to be developing instead of confirmed. Update 2: We might feel a debunk coming on. 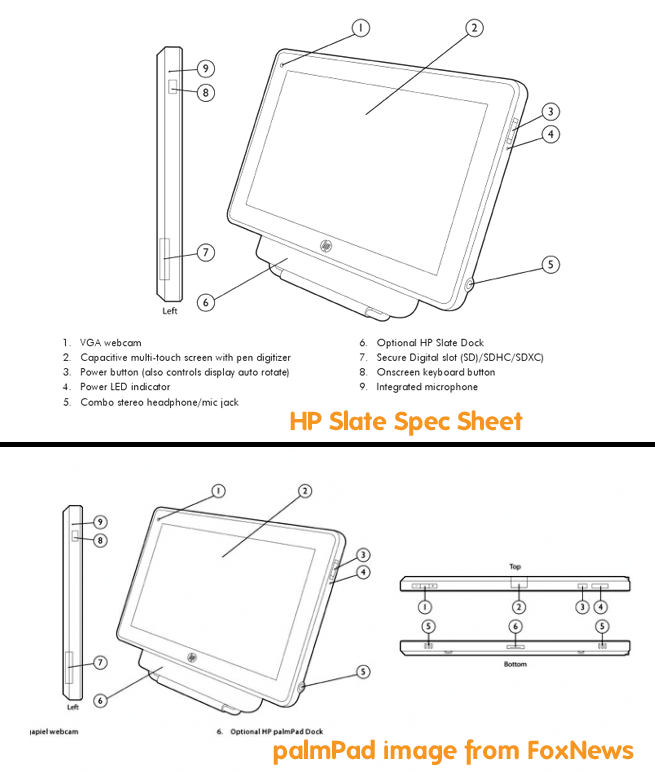 This is the HP quick speck sheet from HP in PDF form. The images match the above images from FoxNews exactly except that "Optional HP Slate Dock" has been replaced with "Optional HP palmPad Dock." The numbers match as well. In other words, the image from FoxNews is most definitely a repurposed HP Slate. It's still possible that somebody from within HP simply used those images as a stand-in on the palmPad specs, but again, this one's up in the air, folks.